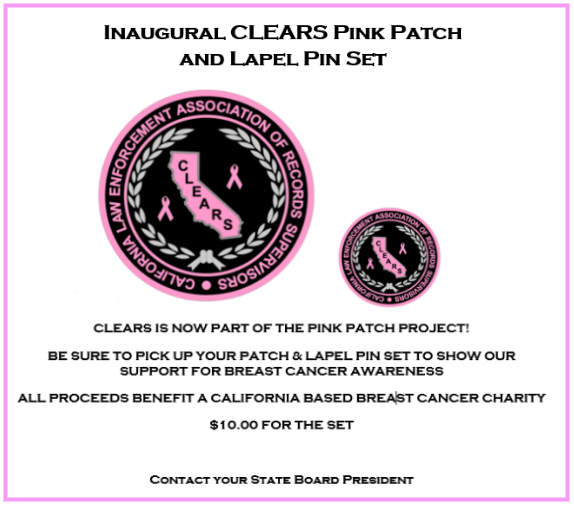 The CLEARS Border Chapter was formed in 1983 and currently consists of approximately 30 members from two counties in Southern California which share the border with Mexico. We stretch from the Pacific Ocean in the County of San Diego to the flat land of Imperial County. The Border Chapter is one of the smallest groups within the CLEARS organization. We have a dedicated membership who work diligently to keep each other informed on issues affecting law enforcement recordkeeping. The member agencies of the Border Chapter include Carlsbad PD, Chula Vista PD, Coronado PD, El Cajon PD, Escondido PD, Imperial County Sheriff, La Mesa PD, National City PD, Oceanside PD, San Diego Harbor PD, San Diego Sheriffs Office, San Diego State PD, University of California PD, ARJIS and SANDAG. One of the most regionally friendly counties, San Diego has established unique law enforcement databases that share information throughout the County of San Diego. The focus of our monthly meetings is training and networking with each other. Our members know that they can call on one another for expertise, sharing of information on technology and record management issues that we face. We value our association with each other. Our monthly training meetings are held on the 4th Thursday of every odd month.